Kenneth Branagh should read all the audio books. He is probably the best narrator I’ve ever listened to, however. Of course, I’m also about to listen to Ian McKellen do Fagles’s translation of The Odyssey, so I may stand corrected shortly. 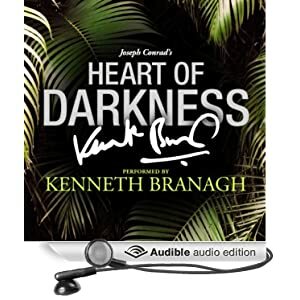 If you haven’t read Heart of Darkness before, I can’t think of a better way to do it than listening to Audible’s version. After all, Marlow tells the entire story to a crew of sailors on the Thames River, and Branagh perfectly embodies not just Marlow, but all the characters, from the Russian protege to Kurtz to the native man who says, “Mistah Kurtz, he dead” to Kurtz’s “intended.” In fact, I dare you not to get a chill when he reads Kurtz. He almost makes you understand why Kurtz has so captivated everyone in the novel. Almost. I think the reason this novel is still relevant is that it speaks to our infinite capacity for evil. All of us have it inside us, and “the horror” is realizing that fact. I think Chinua Achebe’s criticism of the novel is valid. It is racist. (It’s sexist, too, but that fact often goes uncommented upon.) The African characters are only so much scenery, and their culture is dehumanized. They are depicted like animals, slavish in their devotion to and fear of Kurtz. There is no getting around it. At the same time, you can look at Marlow as narrator. Who is he but a perfect product of his times? Of course he believes Africans to be subhuman. Conrad probably thought so, too, but it is Marlow who tells the story, so who can say? There probably is no such thing as a completely reliable narrator. You might like this Book Drum profile of the novel. I found the section on the history of the Congo very interesting (and very tragic, as is the case in so many places colonized by Europe). After listening to it with that connection in mind, I had to agree that the song and the novel shared such a close connection that I have wondered for years if Trent Reznor was thinking of Heart of Darkness when he wrote it. Connect Reznor’s last line “You know who you are” with Kurtz’s last words “The horror, the horror,” and it’s just plain spooky. And I know I make that connection every time I talk about the novel now. I did it in my previous review of Heart of Darkness. This is the third time I’ve read the novel—once in college, once a few years ago. You can’t unhear it. Sorry. Not really.